Sandi Augustine is the one-woman powerhouse (who still gets help from friends and family!) 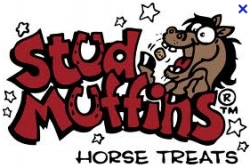 behind the Stud Muffins® brand of horse treats. Here in her own words is the story of how she started making The Ultimate Horse Treat….. “I first started making horse treats in October of 1997. I was managing a barn of 36 horses and wanted to make the horses a treat for Halloween. I didn’t have much spare time, having little or no help with the barn chores. I did spend the weekends and the couple of hours I had off in the afternoons trying to perfect a recipe. I had inquired several recipes from friends at the barn and books but none suited the purpose that I was looking for. I had one recipe that I liked but still didn’t come out with the consistency that I was looking for. So one rainy afternoon I enlisted the help of my friend Michelle and we concocted up a formula that was more to my pleasing.